South Florida immigrant families wait and worry outside an ICE Office in Miramar. At the office, hundreds of immigrants under ICE supervision have to check in. Their families wait to see if their loved ones will emerge free or be deported. From the main road, it looks like just another non-descript office park building amid the suburban sprawl of Miramar. But a closer look reveals signs advising against trespassing on US government property, or carrying weapons or drugs, noting all who enter are subject to search. Outside, you can also see anxiety. It’s etched in the faces of family members, waiting to see if loved ones who entered the building will emerge in freedom. Each week, hundreds of immigrants in South Florida who are subject to possible deportation check in here with Immigrations and Customs Enforcement. For various reasons, they have not been detained and returned to their countries of origin. Instead, many are free on orders of supervision – essentially their word that they will stay in touch with ICE while their immigration issues play out. But since President Donald Trump took office – having vowed to create a deportation force to remove 11 million undocumented people -- the legal and political landscape that determines their fate is shifting. 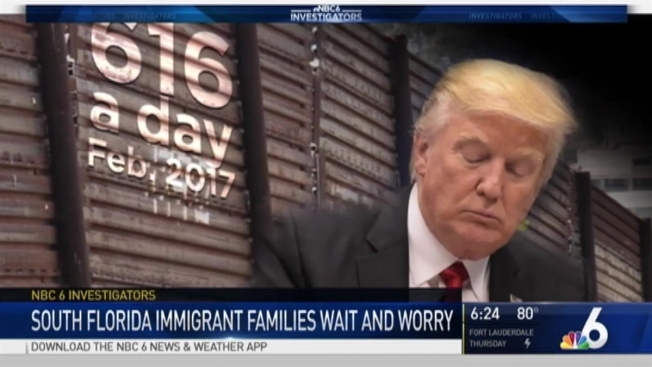 That has led to rumors in the immigrant community in South Florida, which is home to an estimated half million undocumented persons. Many have heard unfounded claims of checkpoints and raids, of ID checks for anyone who likes like he or she may be undocumented. In fact, ICE reports, the 616 people it removed each day from the US in February 2017 – Trump’s first full month in office – is not significantly different from the 607 removed each day in February 2016. But try telling that to clients of immigration attorney Jessica Martinez. "That’s the big hysteria that’s happening now," she said of the rampant rumors of roundups. "When people are speaking to each other, that’s what’s getting everyone excited." Still, since Trump ordered ICE to cast a broader, less discerning net nationwide for people subject to deportation, lawyers here say they have seen a difference, but so far a slight one. The share of people who enter the building and do not come out, Martinez said, is "just a little bit more than before, but not as much as people are scared of." Ashley Hall was scared this month when she dropped off the father of her 9-year-old son for his annual meeting. Hours later, she was downright distraught, collapsing on the sidewalk when, she told NBC 6 Investigators, she got the dreaded word: 38-year-old Kendy Louis-Jean was being taken to Krome detention center for deportation back to Haiti. Louis-Jean was convicted of a felony, carrying a concealed firearm, in 2007. Other than arrests for driving without a valid license, his felony record appears to be clean since then. And, Hall said, he has repeatedly shown up for his ICE interviews and been released with a promise to re-appear. "They want to deport Haitians and anyone who’s not a US citizen," Hall said. Asked what’s changed, she added, "Honestly, probably the president." Jimmy Carter was president when Wadim Pinchasov, then three years old, was brought to the US from Uzbekistan, then part of the Soviet Union. On this day he is 43, and he said things did not look good during his annual visit to the ICE building in Miramar. Twenty years ago, in New Jersey, he was sentenced to four years for robbery. "I was a kid. I made a mistake," he said. That led to a deportation order, but he has raised fears of religious persecution if, as a Jew, he were sent back to what is now the Republic of Uzbekistan. ICE has let him stay and work in the US, knowing that another felony conviction or other misstep could put him in custody – and so far he has avoided that trouble. But during this year’s interview, he sensed ICE’s attitude was hardened, as they questioned his planned travels and kept his supervision document, prompting him to walk outside exasperated, searching for a cigarette. But while policies and priorities have changed under Trump’s order, the laws have not – yet. And, after going back into the offices, Pinchasov emerged with his documentation and another appointment in three months, instead of the usual one year.